Updated May 12, 2012. 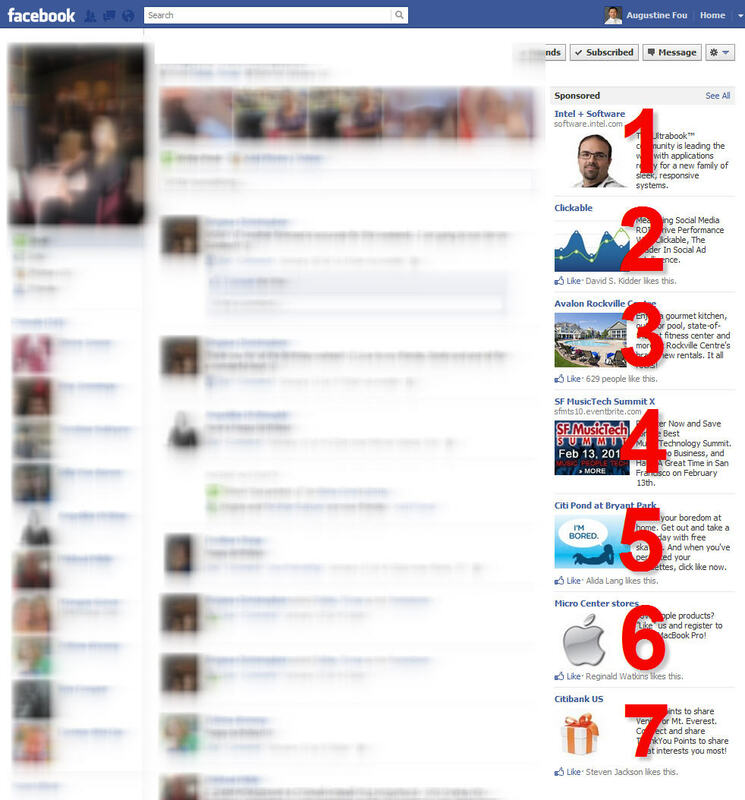 Freddy Nager, Prof of Integrated Marketing at UCLA sent me a screen shot showing 9 display ads per page. The unscupulosity of Facebook is at an all time high – right up to their IPO. THANKS Freddy Nager @AtomicTango, Prof of Integrated Marketing, UCLA for the screen grab of 9 and 10 ads per page. Updated February 3, 2012. 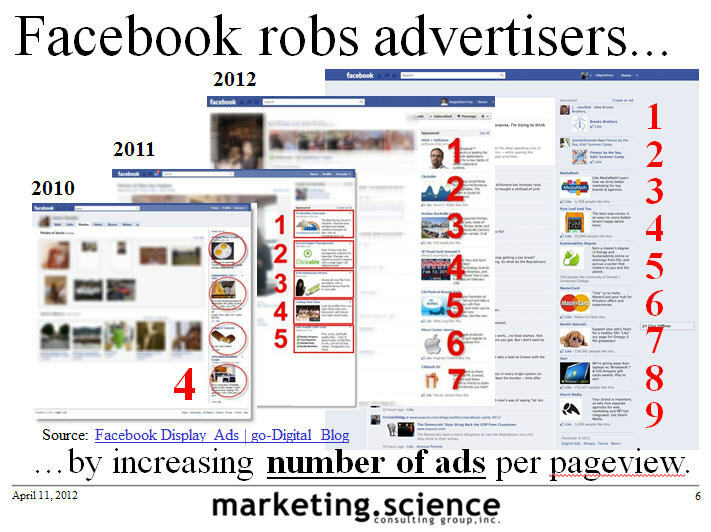 This is how Facebook is growing ad revenues – SEVEN DISPLAY ADS PER PAGE – EVIL! But despite this kind of “cheating” their revenues are decelerating. And there is the “danger” of advertisers getting smart and changing from paying on a CPM basis to paying only on a CPC basis — paying only when they get the click. 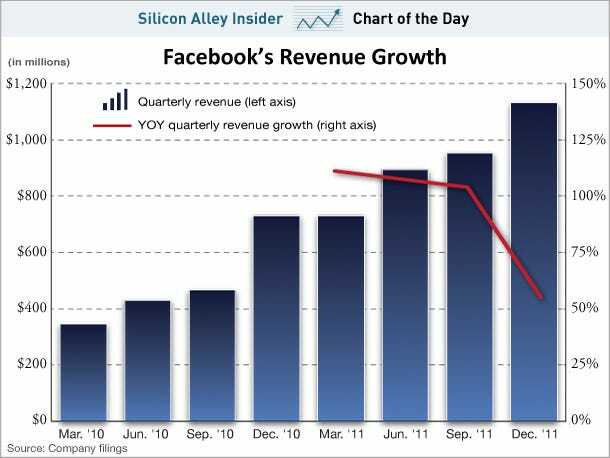 That would mean Facebook’s revenue could drop off a cliff. 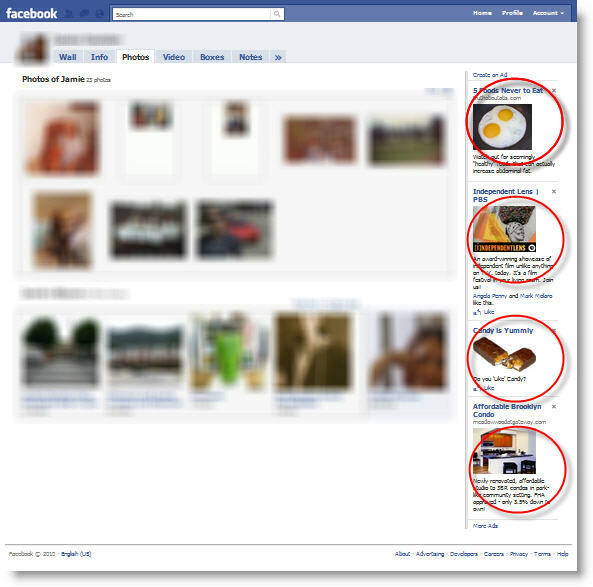 Updated: FIVE (count ’em) 5 ads per page – SHAME on you Facebook – the highway robbery gets worse. Advertisers, quick, go to CPC (don’t pay CPMs any more). Multiple ads on the same page run up the impression numbers, but artificially depress click-throughs because even if they wanted to, users can only click on one ad at a time. Shame on your Facebook for overtly and systematically robbing advertisers who pay on a CPM basis. But then again shame on you advertisers who still pay CPMs when you can easily click a radio button to select CPC — Facebook even suggests a range for you automatically (see inset below). 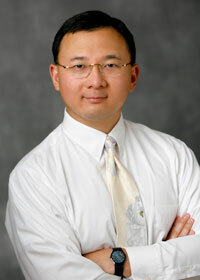 What is the advantage of paying by CPC (cost per click) instead of CPM (cost per thousand impressions)? Well, remember the old ad industry joke “I know I am wasting half my ad dollars, I just don’t know which half” — well, now you know. In fact, you now know you are wasting 99% of your ad dollars to wasted impressions that get no action/clicks from users AND you know which 99%. See infographic below. So stop paying CPMs and start paying CPCs TODAY. Your ad budget will thank you! 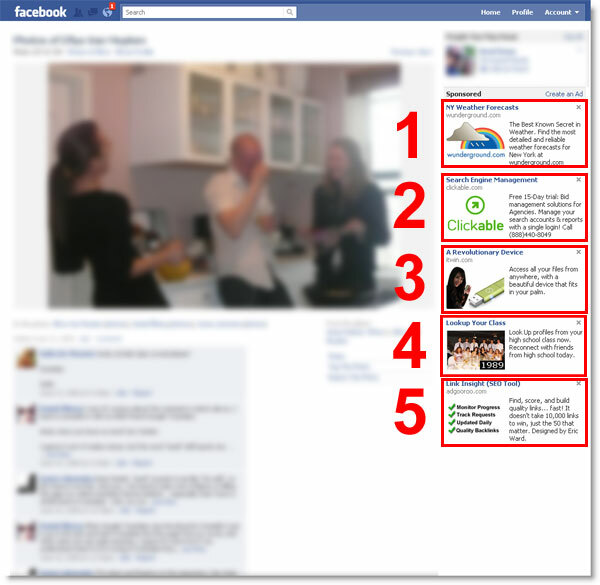 Just how DISMAL are Facebook advertising metrics and benchmarks (click to see )? 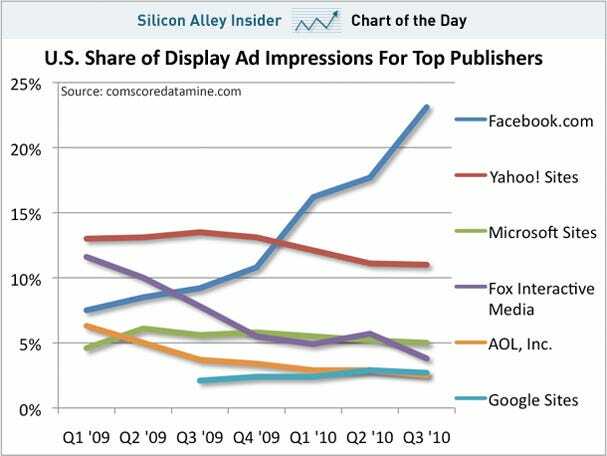 According to data from comScore, in Q3 2010, Facebook served 297 billion display ad impressions giving it 23% of the U.S. market for display ads. In digital channels, since there is no longer the physical limitation of time (airtime on TV) or space (area to put ads on dead-tree pulp) companies can create “inventory” out of thin air and magically increase revenue on the backs of advertisers still willing to pay for impressions. I guess it really is caveat emptor.